The Soil Moisture Active Passive Observatory Mission (SMAP) will produce global maps of soil moisture. 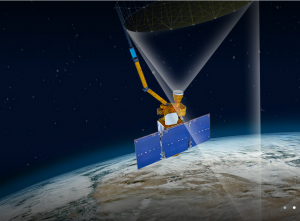 Congratulations to the U.S. National Aeronautics & Space Administration (NASA) for the successful launch of the Soil Moisture Active Passive (SMAP) Observatory on January 31, 2015. SMAP will provide the most accurate and highest resolution maps of soil moisture ever obtained, mapping the globe every two to three days from space for at least three years with about a 6-mile (10-kilometer) resolution. The value of high-resolution measurements of soil moisture has been recognized for decades, but existing ground-based measurements of soil moisture can be sparse. SMAP will provide high-resolution space-based measurements of soil moisture and whether the soil is frozen or thawed, helping scientists observe and predict natural hazards of extreme weather and climate change and reduce uncertainties in our understanding of Earth’s water, energy and carbon cycles. SMAP data will also help scientists monitor droughts and better predict flooding caused by severe rainfall or snowmelt — information that could save lives and property. In addition, since plant growth depends on the amount of water in the soil, SMAP data will allow nations to better forecast crop yields for global famine early-warning systems. The SMAP mission will validate a space-based measurement approach that could be used for future space missions to systematically monitor soil moisture. Please visit the SMAP website for more information.